This document describes how to manage, create, configure, and use Red Hat Ceph Storage Block Devices. and even traditional 9-track tape. The ubiquity of block device interfaces makes a virtual block device an ideal candidate to interact with a mass data storage system like Red Hat Ceph Storage. Ceph Block Devices interact with OSDs by using the librbd library. Ceph Block Devices deliver high performance with infinite scalability to Kernel Virtual Machines (KVMs) such as Quick Emulator (QEMU), and cloud-based computing systems like OpenStack and CloudStack that rely on the libvirt and QEMU utilities to integrate with Ceph Block Devices. You can use the same cluster to operate the Ceph Object Gateway and Ceph Block Devices simultaneously. To use Ceph Block Devices, you must have access to a running Ceph Storage Cluster. For details on installing the Red Hat Ceph Storage, see the Installation Guide for Red Hat Enterprise Linux or Installation Guide for Ubuntu. The rbd command enables you to create, list, introspect, and remove block device images. You can also use it to clone images, create snapshots, rollback an image to a snapshot, view a snapshot, and so on. You must have access to a running Ceph Storage Cluster. For details, see the Red Hat Ceph Storage 3 Installation Guide for Red Hat Enterprise Linux or Installation Guide for Ubuntu. You must install the Ceph Block Device client. For details, see the Red Hat Ceph Storage 3 Installation Guide for Red Hat Enterprise Linux or Installation Guide for Ubuntu. The Manually Installing Ceph Block Device chapter also provides information on mounting and using Ceph Block Devices on client nodes. Execute these steps on client nodes only after creating an image for the Block Device in the Ceph Storage Cluster. See Section 2.4, “Creating Block Device Images” for details. The -h option still displays help for all available commands. You MUST create a pool first before you can specify it as a source. See the Pools chapter in the Storage Strategies guide for Red Hat Ceph Storage 3 for additional details. Ensure a pool for rbd exists before creating an image. See Creating Block Device Pools for additional details. Ceph block device images are thin provisioned. They do not actually use any physical storage until you begin saving data to them. However, they do have a maximum capacity that you set with the --size option. RADOS Block Device (RBD) images can be moved to the trash using the rbd trash command. This command provides more options than the rbd rm command. Once an image is moved to the trash, it can be removed from the trash at a later time. This helps to avoid accidental deletion. Once an image is in the trash, it is assigned a unique image ID. You will need this image ID to specify the image later if you need to use any of the trash options. Execute the rbd trash list for a list of IDs of the images in the trash. This command also returns the image’s pre-deletion name. In addition, there is an optional --image-id argument that can be used with rbd info and rbd snap commands. Use --image-id with the rbd info command to see the properties of an image in the trash, and with rbd snap to remove an image’s snapshots from the trash. Once an image is removed from the trash, it cannot be restored. Once the --delay option is enabled, an image cannot be removed from the trash within the specified timeframe unless forced. As long as an image has not been removed from the trash, it can be restored using the rbd trash restore command. You can enable or disable image features, such as fast-diff, exclusive-lock, object-map, or journaling, on already existing images. The deep flatten feature can be only disabled on already existing images but not enabled. To use deep flatten, enable it when creating images. Ceph supports adding custom image metadata as key-value pairs. The pairs do not have any strict format. 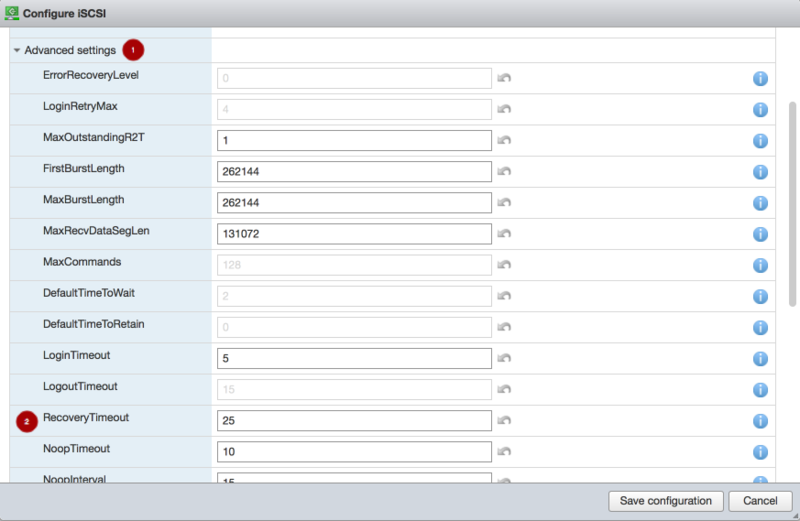 Also, by using metadata, you can set the RBD configuration parameters for particular images. See Overriding the Default Configuration for Particular Images for details. Use the rbd image-meta commands to work with metadata. See Block Device Configuration Reference for a list of possible configuration options. A snapshot is a read-only copy of the state of an image at a particular point in time. One of the advanced features of Ceph block devices is that you can create snapshots of the images to retain a history of an image’s state. Ceph also supports snapshot layering, which allows you to clone images (for example a VM image) quickly and easily. Ceph supports block device snapshots using the rbd command and many higher level interfaces, including QEMU, libvirt,OpenStack and CloudStack. To use RBD snapshots, you must have a running Ceph cluster. If an image has any clones, the cloned images retain reference to the parent image snapshot. To delete the parent image snapshot, you must flatten the child images first. See Flattening a Cloned Image for details. Ceph OSD daemons delete data asynchronously, so deleting a snapshot does not free up the disk space immediately. Execute the rbd help snap rename command to display additional details on renaming snapshots. Ceph supports the ability to create many copy-on-write (COW) or copy-on-read (COR) clones of a block device snapshot. Snapshot layering enables Ceph block device clients to create images very quickly. For example, you might create a block device image with a Linux VM written to it; then, snapshot the image, protect the snapshot, and create as many clones as you like. A snapshot is read-only, so cloning a snapshot simplifies semantics—​making it possible to create clones rapidly. The terms parent and child mean a Ceph block device snapshot (parent), and the corresponding image cloned from the snapshot (child). These terms are important for the command line usage below. Each cloned image (child) stores a reference to its parent image, which enables the cloned image to open the parent snapshot and read it. This reference is removed when the clone is flattened that is, when information from the snapshot is completely copied to the clone. For more information on flattening see Section 3.3.6, “Flattening Cloned Images”. A clone of a snapshot behaves exactly like any other Ceph block device image. You can read to, write from, clone, and resize cloned images. There are no special restrictions with cloned images. However, the clone of a snapshot refers to the snapshot, so you MUST protect the snapshot before you clone it. A clone of a snapshot can be a copy-on-write (COW) or copy-on-read (COR) clone. Copy-on-write (COW) is always enabled for clones while copy-on-read (COR) has to be enabled explicitly. Copy-on-write (COW) copies data from the parent to the clone when it writes to an unallocated object within the clone. Copy-on-read (COR) copies data from the parent to the clone when it reads from an unallocated object within the clone. Reading data from a clone will only read data from the parent if the object does not yet exist in the clone. Rados block device breaks up large images into multiple objects (defaults to 4 MB) and all copy-on-write (COW) and copy-on-read (COR) operations occur on a full object (that is writing 1 byte to a clone will result in a 4 MB object being read from the parent and written to the clone if the destination object does not already exist in the clone from a previous COW/COR operation). Whether or not copy-on-read (COR) is enabled, any reads that cannot be satisfied by reading an underlying object from the clone will be rerouted to the parent. Since there is practically no limit to the number of parents (meaning that you can clone a clone), this reroute continues until an object is found or you hit the base parent image. If copy-on-read (COR) is enabled, any reads that fail to be satisfied directly from the clone result in a full object read from the parent and writing that data to the clone so that future reads of the same extent can be satisfied from the clone itself without the need of reading from the parent. This is essentially an on-demand, object-by-object flatten operation. This is specially useful when the clone is in a high-latency connection away from it’s parent (parent in a different pool in another geographical location). Copy-on-read (COR) reduces the amortized latency of reads. The first few reads will have high latency because it will result in extra data being read from the parent (for example, you read 1 byte from the clone but now 4 MB has to be read from the parent and written to the clone), but all future reads will be served from the clone itself. To create copy-on-read (COR) clones from snapshot you have to explicitly enable this feature by adding rbd_clone_copy_on_read = true under [global] or [client] section in your ceph.conf file. Image Template: A common use case for block device layering is to create a master image and a snapshot that serves as a template for clones. For example, a user may create an image for a RHEL7 distribution and create a snapshot for it. Periodically, the user may update the image and create a new snapshot (for example yum update, yum upgrade, followed by rbd snap create). As the image matures, the user can clone any one of the snapshots. Extended Template: A more advanced use case includes extending a template image that provides more information than a base image. For example, a user may clone an image (for example, a VM template) and install other software (for example, a database, a content management system, an analytics system, and so on) and then snapshot the extended image, which itself may be updated just like the base image. You may clone a snapshot from one pool to an image in another pool. For example, you may maintain read-only images and snapshots as templates in one pool, and writable clones in another pool. Cloned images retain a reference to the parent snapshot. When you remove the reference from the child clone to the parent snapshot, you effectively "flatten" the image by copying the information from the snapshot to the clone.The time it takes to flatten a clone increases with the size of the snapshot. Because a flattened image contains all the information from the snapshot, a flattened image will use more storage space than a layered clone. If the deep flatten feature is enabled on an image, the image clone is dissociated from its parent by default. RADOS Block Device (RBD) mirroring is a process of asynchronous replication of Ceph block device images between two or more Ceph clusters. Mirroring ensures point-in-time consistent replicas of all changes to an image, including reads and writes, block device resizing, snapshots, clones and flattening. Mirroring can run in either an active-passive or active-active configuration; that is, using mandatory exclusive locks and the RBD journaling feature, RBD records all modifications to an image in the order in which they occur. This ensures that a crash-consistent mirror of the remote image is available locally. Therefore, before an image can be mirrored to a peer cluster, you must enable journaling. See Section 4.1, “Enabling Journaling” for details. Since, it is the images stored in the local and remote pools associated to the block device that get mirrored, the CRUSH hierarchy for the local and remote pools should have the same storage capacity and performance characteristics. Additionally, the network connection between the local and remote sites should have sufficient bandwidth to ensure mirroring happens without too much latency. The CRUSH hierarchies supporting local and remote pools that mirror block device images SHOULD have the same capacity and performance characteristics, and SHOULD have adequate bandwidth to ensure mirroring without excess latency. For example, if you have X MiB/s average write throughput to images in the primary cluster, the network must support N * X throughput in the network connection to the secondary site plus a safety factor of Y% to mirror N images. Mirroring serves primarily for recovery from a disaster. Depending on which type of mirroring you use, see either Recovering from a disaster with one-way mirroring or Recovering from a disaster with two-way mirroring, for details. The rbd-mirror daemon is responsible for synchronizing images from one Ceph cluster to another. When data is mirrored from a primary cluster to a secondary cluster that serves as a backup,rbd-mirror runs ONLY on the backup cluster. 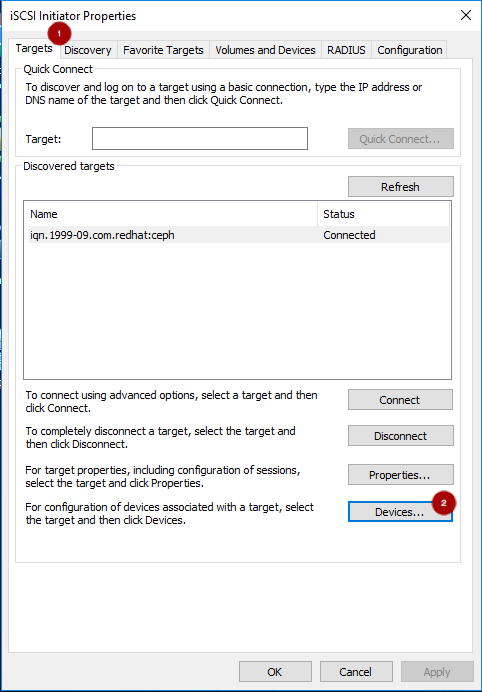 RBD mirroring may have multiple secondary sites in an active-passive configuration. When the data is mirrored from mirrored from a primary cluster to a secondary cluster and the secondary cluster can mirror back to the primary and each other, both clusters must have rbd-mirror running. Currently, two-way replication, also known as an active-active configuration, is supported only between two sites. The rbd-mirror package provides rbd-mirror. In two-way replication, each instance of rbd-mirror must be able to connect to the other Ceph cluster simultaneously. Additionally, the network must have sufficient bandwidth between the two data center sites to handle mirroring. Only run a single rbd-mirror daemon per a Ceph cluster. All images in a pool with the journaling feature enabled are mirrored. See Configuring Pool Mirroring for details. Only a specific subset of images within a pool is mirrored and you must enable mirroring for each image separately. See Configuring Image Mirroring for details. It is possible to demote primary images and promote non-primary images. See Section 4.3, “Image Configuration” for details. Journaling depends on the exclusive-lock feature which must be enabled too. See the following steps. Execute the following commands on both peer clusters. See Mirroring Modes for details. Before disabling mirroring, remove the peer clusters. See Section 4.2, “Pool Configuration” for details. When you disable mirroring on a pool, you also disable it on any images within the pool for which mirroring was enabled separately in image mode. See Image Configuration for details. Specify the pool name and the peer Universally Unique Identifier (UUID). To view the peer UUID, use the rbd mirror pool info command. To output status details for every mirroring image in a pool, use the --verbose option. Execute the following commands on a single cluster only. Enable mirroring of the whole pool in image mode on both peer clusters. See Section 4.2, “Pool Configuration” for details. Depending on which type of mirroring you use, see either Recovering from a disaster with one-way mirroring or Recovering from a disaster with two-way mirroring, for details. Use forced promotion when the demotion cannot be propagated to the peer Ceph cluster, for example because of cluster failure or communication outage. See Failover After a Non-Orderly Shutdown for details. Do not force promote non-primary images that are still syncing, because the images will not be valid after the promotion. In case of an inconsistent state between the two peer clusters, the rbd-mirror daemon does not attempt to mirror the image that causing it. For details on fixing this issue, see the section on recovering from a disaster. Depending on which type of mirroring you use, see either Recovering from a disaster with one-way mirroring or Recovering from a disaster with two-way mirroring, for details. One-way mirroring implies that a primary image in one cluster gets replicated in a secondary cluster. In the secondary or remote cluster, the replicated image is non-primary; that is, block device clients cannot write to the image. One-way mirroring supports multiple secondary sites in an active-passive configuration. To configure one-way mirroring on multiple secondary sites, repeat the following procedures on each remote cluster. One-way mirroring is appropriate for maintaining a crash-consistent copy of an image. One-way mirroring may not be appropriate for all situations, such as using the secondary image for automatic failover and failback with OpenStack, since the cluster cannot failback when using one-way mirroring. In those scenarios, use two-way mirroring. See Section 4.5, “Configuring Two-Way Mirroring” for details. Two Ceph clusters for replicating block device images one way; that is, replicating images from a primary image in a cluster named local to a second cluster named remote as used in this procedure. The clusters have corresponding configuration files located in the /etc/ceph/ directory - local.conf and remote.conf. For information on installing the Ceph Storage Cluster see the Installation Guide for Red Hat Enterprise Linux or Installation Guide for Ubuntu. If you have two Ceph clusters with the same name, usually the default ceph name, see Configuring Mirroring Between Clusters With The Same Name for additional required steps. The data pool is created on both clusters. See the Pools chapter in the Storage Strategies guide or Red Hat Ceph Storage 3 for details. The data pool on the local cluster contains images you want to mirror (in the procedures below named image1 and image2) and journaling is enabled on the images. See Enabling Journaling for details. Pool Mirroring: To mirror all images within a pool, use the Configuring Pool Mirroring procedure. Image Mirroring: To mirror select images within a pool, use the Configuring Image Mirroring procedure. Ensure that all images within the data pool have exclusive lock and journaling enabled. See Section 4.1, “Enabling Journaling” for details. On the monitor node of the remote cluster, install the rbd-mirror package. The package is provided by the Red Hat Ceph Storage 3 Tools repository. The rbd-mirror daemon can run on any host in the cluster. It does not have to be a Monitor or OSD host. However, only one rbd-mirror daemon per secondary or remote cluster. On both clusters, create users with permissions to access the data pool and output their keyrings to a <cluster-name>.client.<user-name>.keyring file. Where <client-id> is the Ceph Storage cluster user that the rbd-mirror daemon will use. The user must have the appropriate cephx access to the cluster. For detailed information, see the User Management chapter in the Administration Guide for Red Hat Ceph Storage 3. Ensure the selected images to be mirrored within the data pool have exclusive lock and journaling enabled. See Section 4.1, “Enabling Journaling” for details. Follow steps 2 - 6 in the Configuring Pool Mirroring procedure. You have two Ceph clusters, named local and remote. The clusters have corresponding configuration files located in the /etc/ceph/ directory - local.conf and remote.conf. For information on installing the Ceph Storage Cluster, see the Installation Guide for Red Hat Enterprise Linux or Installation Guide for Ubuntu. If you have two Ceph clusters with the same name, usually the default ceph name, see Configuring Mirroring Between Clusters With The Same Name for additional required steps. One block device client is connected to each of the clusters - client.local and client.remote. For information on installing Ceph clients, see the Installation Guide for Red Hat Enterprise Linux or Installation Guide for Ubuntu. The data pool is created on both clusters. See the Pools chapter in the Storage Strategies guide for Red Hat Ceph Storage 3. On both clients, install the rbd-mirror package. The package is provided by the Red Hat Ceph Storage 3 Tools repository. Copy the Ceph configuration files and the newly created keyrings between the peer clusters. Where <client-id> is a unique client ID for use by the rbd-mirror daemon. The client must have the appropriate cephx access to the cluster. For detailed information, see the User Management chapter in the Administration Guide for Red Hat Ceph Storage 3. Follow the steps 1 - 5 in the Configuring Pool Mirroring procedure. Change the name of the cluster in the /etc/sysconfig/ceph file on the rbd-mirror node on cluster A. For example, CLUSTER=master. On Ubuntu change the cluster name in the /etc/default/ceph file. # ln -s ceph.conf master.conf  #only on the mirror node on cluster A.
now refer to the same cluster. Whether you are using one- or two-way replication, you can delay replication between RADOS Block Device (RBD) mirroring images. You may want to implement delayed replication if you want a window of cushion time in case an unwanted change to the primary image needs to be reverted before being replicated to the secondary image. To implement delayed replication, the rbd-mirror daemon within the destination cluster should set the rbd mirroring replay delay = <minimum delay in seconds> configuration setting. This setting can either be applied globally within the ceph.conf file utilized by the rbd-mirror daemons, or on an individual image basis. To recover from a disaster when using one-way mirroring use the following procedures. They show how to fail over to the secondary cluster, named remote, after the primary cluster, named local, terminates, and how to failback. The shutdown can be orderly or non-orderly. One-way mirroring supports multiple secondary sites. If you are using additional secondary clusters, choose one of the secondary, or remote, clusters to fail over to. Synchronize from the same cluster during failback. At least two running clusters. Pool mirroring or image mirroring configured with one way mirroring. Stop all clients that use the primary image. This step depends on which clients use the image. For example, detach volumes from any OpenStack instances that use the image. See the Block Storage and Volumes chapter in the Storage Guide for Red Hat OpenStack Platform 13. Verify that the primary cluster is down. Stop all clients that use the primary image. This step depends on which clients use the image. For example, detach volumes from any OpenStack instances that use the image. See the Block Storage and Volumes chapter in the Storage Guide for Red Hat OpenStack Platform 10. When using one-way mirroring the primary cluster must be configured for mirroring in order to resynchronize the images during failback. This is not required when using two-way mirroring because mirroring is already configured on the primary cluster to support mirroring in both directions. If you are using multiple secondary clusters, only the secondary cluster chosen to fail over to, and failback from, must be added. When the formerly primary cluster recovers, failback to it. Repeat this step on any additional secondary clusters. 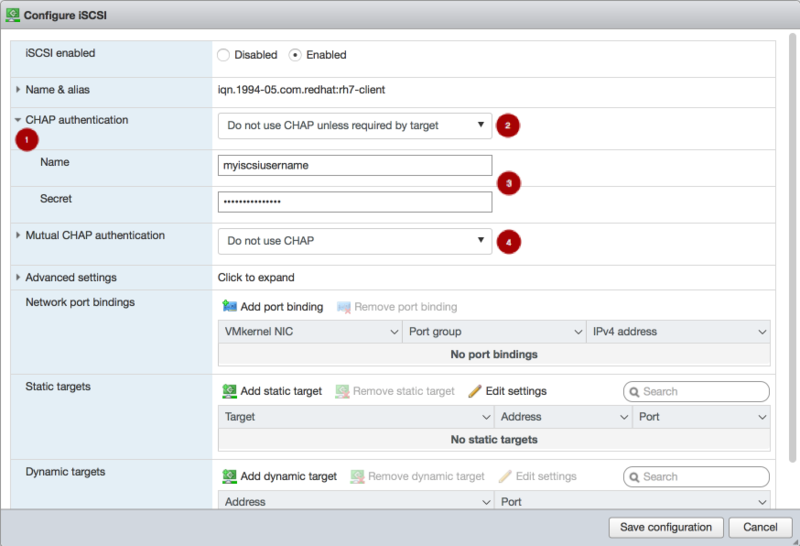 Change remote to the name of the additional secondary cluster you are resynchronizing from. If there are multiple secondary clusters, this only needs to be done from the secondary cluster where it was promoted. In the Prepare for failback section above, functions for two-way mirroring were configured to enable synchronization from the remote cluster to the local cluster. After failback is complete these functions can be disabled. For details on demoting, promoting, and resyncing images, see Image configuration in the Block device guide. non-orderly (Failover After a Non-Orderly Shutdown). If the shutdown is non-orderly, the Failback procedure requires resynchronizing the image. or image mode mirroring (see Configuring Image Mirroring). See Section 4.3, “Image Configuration” for details. Resume the access to the peer image. This step depends on which clients use the image. When updating a cluster using Ceph Block Device mirroring with an asynchronous update, follow the installation instruction for the update. Then, restart the Ceph Block Device instances. There is no required order for restarting the instances. Red Hat recommends restarting the instance pointing to the pool with primary images followed by the instance pointing to the mirrored pool. The rbd python module provides file-like access to RBD images. In order to use this built-in tool, the rbd and rados modules must be imported. This writes 'foo' to the first 600 bytes of the image. Note that data cannot be :type:unicode - librbd does not know how to deal with characters wider than a :c:type:char. Clients on Linux distributions aside from Red Hat Enterprise Linux (RHEL) are permitted but not supported. If there are issues found in the cluster (e.g. the MDS) when using these clients, Red Hat will address them, but if the cause is found to be on the client side, the issue will have to be addressed by the kernel vendor. Use rbd to map an image name to a kernel module. You must specify the image name, the pool name and the user name. rbd will load the RBD kernel module if it is not already loaded. To show block device images mapped to kernel modules with the rbd command, specify the showmapped option. To unmap a block device image with the rbd command, specify the unmap option and the device name (by convention the same as the block device image name). The number of block device operation threads. Do not change the default value of rbd_op_threads because setting it to a number higher than 1 might cause data corruption. The timeout (in seconds) for block device operation threads. If true, Ceph will process block device asynchronous I/O operations from a worker thread to prevent blocking. The maximum number of concurrent management operations in flight (for example, deleting or resizing an image). The number of seconds before a maintenance request times out. When set to true, copy-on-read cloning is enabled. If true, allocation hinting is enabled, and the block device will issue a hint to the OSD back end to indicate the expected size object. If true, the block device will skip zeroing a range when trying to discard a range inside an object. Set this option to true to enable the Linux Trace Toolkit Next Generation User Space Tracer (LTTng-UST) tracepoints. See Tracing RADOS Block Device (RBD) Workloads with the RBD Replay Feature for details. Set this option to true to validate empty pools for RBD compatibility. Set this option to true to validate image specifications. It is possible to override the default settings for creating an image. Ceph will create images with format 2 and no striping. The default format (2) if no other format is specified. Format 1 is the original format for a new image, which is compatible with all versions of librbd and the kernel module, but does not support newer features like cloning. Format 2 is supported by librbd and the kernel module since version 3.11 (except for striping). Format 2 adds support for cloning and is more easily extensible to allow more features in the future. The default order if no other order is specified. The default stripe count if no other stripe count is specified. Changing the default value requires striping v2 feature. The default stripe unit if no other stripe unit is specified. Changing the unit from 0 (that is, the object size) requires the striping v2 feature. 1: Layering support. Layering enables you to use cloning. 2: Striping v2 support. Striping spreads data across multiple objects. Striping helps with parallelism for sequential read/write workloads. 4: Exclusive locking support. When enabled, it requires a client to get a lock on an object before making a write. 8: Object map support. Block devices are thin provisioned—​meaning, they only store data that actually exists. Object map support helps track which objects actually exist (have data stored on a drive). Enabling object map support speeds up I/O operations for cloning, or importing and exporting a sparsely populated image. 16: Fast-diff support. Fast-diff support depends on object map support and exclusive lock support. It adds another property to the object map, which makes it much faster to generate diffs between snapshots of an image, and the actual data usage of a snapshot much faster. 32: Deep-flatten support. Deep-flatten makes rbd flatten work on all the snapshots of an image, in addition to the image itself. Without it, snapshots of an image will still rely on the parent, so the parent will not be delete-able until the snapshots are deleted. Deep-flatten makes a parent independent of its clones, even if they have snapshots. The enabled features are the sum of the numeric settings. The current default setting is not compatible with the RBD kernel driver nor older RBD clients. Most of the options are useful mainly for debugging and benchmarking. See man rbd under Map Options for details. The user space implementation of the Ceph block device (that is, librbd) cannot take advantage of the Linux page cache, so it includes its own in-memory caching, called RBD caching. RBD caching behaves just like well-behaved hard disk caching. When the OS sends a barrier or a flush request, all dirty data is written to the OSDs. This means that using write-back caching is just as safe as using a well-behaved physical hard disk with a VM that properly sends flushes (that is, Linux kernel >= 2.6.32). The cache uses a Least Recently Used (LRU) algorithm, and in write-back mode it can coalesce contiguous requests for better throughput. Ceph supports write-through caching for RBD. You can set the size of the cache, and you can set targets and limits to switch from write-back caching to write through caching. To enable write-through mode, set rbd cache max dirty to 0. This means writes return only when the data is on disk on all replicas, but reads may come from the cache. The cache is in memory on the client, and each RBD image has its own. Since the cache is local to the client, there is no coherency if there are others accessing the image. Running GFS or OCFS on top of RBD will not work with caching enabled. The dirty limit for objects - set to 0 for auto calculate from rbd_cache_size. If true, it will block writes to the cache before the aio_write call completes. If false, it will block before the aio_completion is called. Ceph typically reads objects from the primary OSD. Since reads are immutable, you may enable this feature to balance snap reads between the primary OSD and the replicas. Whereas rbd_balance_snap_reads will randomize the replica for reading a snapshot, if you enable rbd_localize_snap_reads, the block device will look to the CRUSH map to find the closest (local) OSD for reading the snapshot. Ceph typically reads objects from the primary OSD. Since reads are immutable, you may enable this feature to balance parent reads between the primary OSD and the replicas. Whereas rbd_balance_parent_reads will randomize the replica for reading a parent, if you enable rbd_localize_parent_reads, the block device will look to the CRUSH map to find the closest (local) OSD for reading the parent. Whether to blacklist clients whose lock was broken. The number of seconds to blacklist - set to 0 for OSD default. The number of bits to shift to compute the journal object maximum size. The value is between 12 and 64. The number of active journal objects. The commit time interval in seconds. The maximum number of pending commits per a journal object. The maximum number of pending bytes per a journal object. The maximum time interval in seconds for pending commits. Specifies a pool for journal objects. 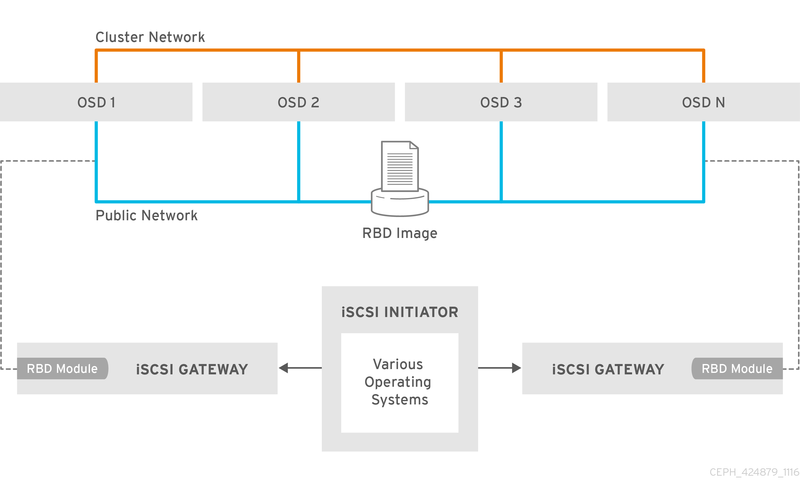 The iSCSI gateway is integrating Red Hat Ceph Storage with the iSCSI standard to provide a Highly Available (HA) iSCSI target that exports RADOS Block Device (RBD) images as SCSI disks. The iSCSI protocol allows clients (initiators) to send SCSI commands to SCSI storage devices (targets) over a TCP/IP network. This allows for heterogeneous clients, such as Microsoft Windows, to access the Red Hat Ceph Storage cluster. Each iSCSI gateway runs the Linux IO target kernel subsystem (LIO) to provide iSCSI protocol support. LIO utilizes a user-space passthrough (TCMU) to interact with Ceph’s librbd library to expose RBD images to iSCSI clients. With Ceph’s iSCSI gateway you can effectively run a fully integrated block-storage infrastructure with all features and benefits of a conventional Storage Area Network (SAN). To implement the Ceph iSCSI gateway there are a few requirements. Red Hat recommends using two nodes for a highly available Ceph iSCSI gateway solution and up to four Ceph iSCSI gateway nodes. For the hardware requirements, see the Red Hat Ceph Storage Hardware Selection Guide. On the iSCSI gateway nodes, the memory footprint of the RBD images can grow to a large size. Plan memory requirements accordingly based off the number RBD images mapped. Each RBD image roughly uses 90 MB of RAM. For more details on setting Ceph configuration options, see the Configuration Guide for Red Hat Ceph Storage 3. Traditionally, block-level access to a Ceph storage cluster has been limited to QEMU and librbd, which is a key enabler for adoption within OpenStack environments. Block-level access to the Ceph storage cluster can now take advantage of the iSCSI standard to provide data storage. A running Red Hat Ceph Storage cluster, version 3.1 or later. iSCSI gateways nodes, which can either be colocated with OSD nodes or on dedicated nodes. 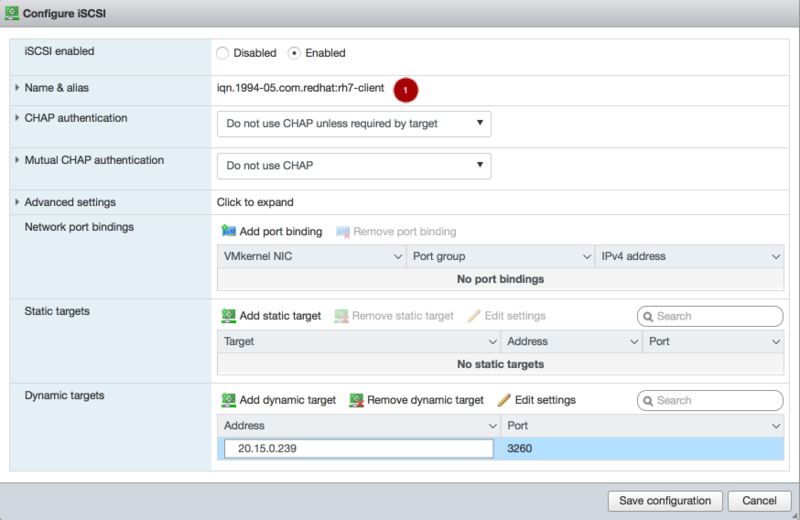 Valid Red Hat Enterprise Linux 7 and Red Hat Ceph Storage 3.2 entitlements/subscriptions on the iSCSI gateways nodes. Separate network subnets for iSCSI front-end traffic and Ceph back-end traffic. Deploying the Ceph iSCSI gateway can be done using Ansible or the command-line interface. A running Red Hat Ceph Storage 3 or later. 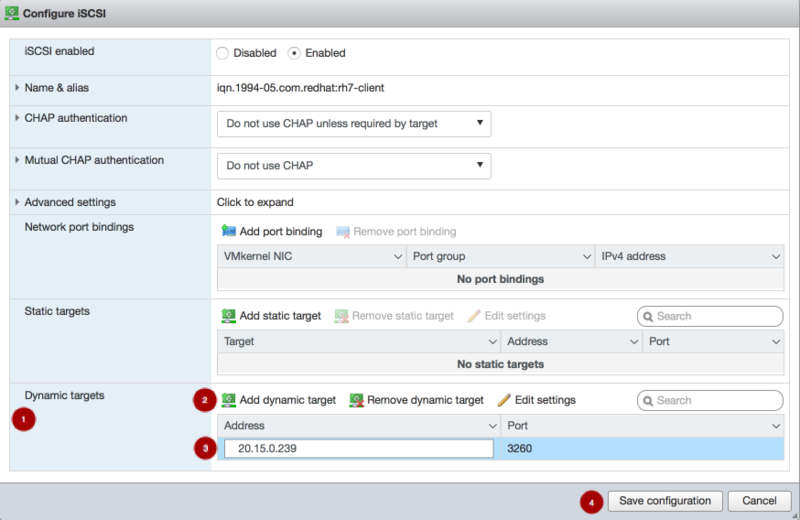 On the iSCSI gateway nodes, enable the Red Hat Ceph Storage 3 Tools repository. For details, see the Enabling the Red Hat Ceph Storage Repositories section in the Installation Guide for Red Hat Enterprise Linux. Enable the Red Hat Ceph Storage 3 Tools repository. For details, see the Enabling the Red Hat Ceph Storage Repositories section in the Installation Guide for Red Hat Enterprise Linux. If colocating the iSCSI gateway with an OSD node, add the OSD node to the [iscsigws] section. The ceph-ansible package places a file in the /usr/share/ceph-ansible/group_vars/ directory called iscsigws.yml.sample. Create a copy of the iscsigws.yml.sample file and name it iscsigws.yml. The new file name (iscsigws.yml) and the new section heading ([iscsigws]) are only applicable to Red Hat Ceph Storage 3.1 or higher. Upgrading from previous versions of Red Hat Ceph Storage to 3.1 will still use the old file name (iscsi-gws.yml) and the old section heading ([iscsi-gws]). Open the iscsigws.yml file for editing. Uncomment the gateway_ip_list option and update the values accordingly, using IPv4 or IPv6 addresses. Providing IP addresses for the gateway_ip_list option is required. You cannot use a mix of IPv4 and IPv6 addresses. Disabling CHAP is only supported on Red Hat Ceph Storage 3.1 or higher. Red Hat does not support mixing clients, some with CHAP enabled and some CHAP disabled. All clients marked as present must have CHAP enabled or must have CHAP disabled. Review the following Ansible variables and descriptions, and update accordingly, if needed. Each gateway needs access to the ceph cluster for rados and rbd calls. This means the iSCSI gateway must have an appropriate /etc/ceph/ directory defined. The seed_monitor host is used to populate the iSCSI gateway’s /etc/ceph/ directory. Define a custom storage cluster name. Define a custom keyring name. If set to true, then deploy the settings when the playbook is ran. This is a boolean value that checks for multipath and lvm configuration settings on each gateway. It must be set to true for at least the first run to ensure multipathd and lvm are configured properly. This is the iSCSI IQN that all the gateways will expose to clients. This means each client will see the gateway group as a single subsystem. The comma separated ip list defines the IPv4 or IPv6 addresses that will be used on the front end network for iSCSI traffic. This IP will be bound to the active target portal group on each node, and is the access point for iSCSI traffic. Each IP should correspond to an IP available on the hosts defined in the iscsigws.yml host group in /etc/ansible/hosts. size = This defines the size of the RBD. You may increase the size later, by simply changing this value, but shrinking the size of an RBD is not supported and is ignored. host = This is the iSCSI gateway host name that will be responsible for the rbd allocation/resize. Every defined rbd_device entry must have a host assigned. state = This is typical Ansible syntax for whether the resource should be defined or removed. A request with a state of absent will first be checked to ensure the rbd is not mapped to any client. If the RBD is unallocated, it will be removed from the iSCSI gateway and deleted from the configuration. This section defines the iSCSI client connection details together with the LUN (RBD image) masking. Currently only CHAP is supported as an authentication mechanism. Each connection defines an image_list which is a comma separated list of the form pool.rbd_image[,pool.rbd_image,…​]. RBD images can be added and removed from this list, to change the client masking. Note, that there are no checks done to limit RBD sharing across client connections. The user name for the API. The default is admin. The password for using the API. The default is admin. The TCP port number for using the API. The default is 5000. Value can be true or false. The default is false. Controls the sleeping interval in seconds for polling the iSCSI management object. The default value is 1. A list of IPv4 or IPv6 addresses who have access to the API. By default, only the iSCSI gateway nodes have access. For rbd_devices, there can not be any periods (.) in the pool name or in the image name. Gateway configuration changes are only supported from one gateway at a time. Attempting to run changes concurrently through multiple gateways may lead to configuration instability and inconsistency. Ansible will install the ceph-iscsi-cli package, create, and then update the /etc/ceph/iscsi-gateway.cfg file based on settings in the group_vars/iscsigws.yml file when the ansible-playbook command is ran. If you have previously installed the ceph-iscsi-cli package using the command line installation procedures, then the existing settings from the iscsi-gateway.cfg file must be copied to the group_vars/iscsigws.yml file. See the Appendix A, Sample iscsigws.yml File to view the full iscsigws.yml.sample file. On the Ansible administration node, do the following steps, as the root user. The Ansible playbook will handle RPM dependencies, RBD creation and Linux iSCSI target configuration. On stand-alone iSCSI gateway nodes, verify that the correct Red Hat Ceph Storage 3.2 software repositories are enabled. If they are unavailable, then the wrong packages will be installed. Do not use the targetcli utility to change the configuration, this will result in the following issues: ALUA misconfiguration and path failover problems. There is the potential to corrupt data, to have mismatched configuration across iSCSI gateways, and to have mismatched WWN information, which will lead to client pathing problems. The ceph-iscsi-config package installs the configuration management logic and a Systemd service called rbd-target-gw. When the Systemd service is enabled, the rbd-target-gw will start at boot time and will restore the Linux iSCSI target state. Deploying the iSCSI gateways with the Ansible playbook disables the target service. Below are the outcomes of interacting with the rbd-target-gw Systemd service. A reload request will force rbd-target-gw to reread the configuration and apply it to the current running environment. This is normally not required, since changes are deployed in parallel from Ansible to all iSCSI gateway nodes. A stop request will close the gateway’s portal interfaces, dropping connections to clients and wipe the current Linux iSCSI target configuration from the kernel. This returns the iSCSI gateway to a clean state. When clients are disconnected, active I/O is rescheduled to the other iSCSI gateways by the client side multipathing layer. Within the /usr/share/ceph-ansible/group_vars/iscsigws.yml file there are a number of operational workflows that the Ansible playbook supports. Red Hat does not support managing RBD images exported by the Ceph iSCSI gateway tools, such as gwcli and ceph-ansible. Also, using the rbd command to rename or remove RBD images exported by the Ceph iSCSI gateway, can result in an unstable storage cluster. Before removing RBD images from the iSCSI gateway configuration, follow the standard procedures for removing a storage device from the operating system. For clients and systems using Red Hat Enterprise Linux 7, see the Red Hat Enterprise Linux 7 Storage Administration Guide for more details on removing devices. Adding another entry to the rbd_devices section with the new image. Updating the size parameter within the rbd_devices section. Client side actions are required to pick up the new size of the disk. Adding an entry to the client_connections section. Adding the relevant RBD pool.image name to the image_list variable for the client. Removing the RBD pool.image name from the clients image_list variable. Changing the RBD entry state variable to absent. The RBD image must be unallocated from the operating system first for this to succeed. Updating the relevant CHAP details in client_connections. This will need to be coordinated with the clients. For example, the client issues an iSCSI logout, the credentials are changed by the Ansible playbook, the credentials are changed at the client, then the client performs an iSCSI login. Updating the relevant client_connections item with a state of absent. Once the Ansible playbook is ran, the client will be purged from the system, but the disks will remain defined to Linux iSCSI target for potential reuse. Once a change has been made, rerun the Ansible playbook to apply the change across the iSCSI gateway nodes. Replace $TARGET_NAME with the configured iSCSI target name. Logout of [sid: 1, target: iqn.2003-01.com.redhat.iscsi-gw:iscsi-igw, portal: 10.172.19.21,3260] successful. Logout of [sid: 2, target: iqn.2003-01.com.redhat.iscsi-gw:iscsi-igw, portal: 10.172.19.22,3260] successful. See the Microsoft documentation for more details. See the VMware documentation for more details. Replace $TARGET_NAME with the configured iSCSI target name, and replace $CLIENT_NAME with iSCSI initiator name. Replace $POOL_NAME with the name of the pool, and replace the $IMAGE_NAME with the name of the image. In this mode the Linux iSCSI target configuration is purged on all iSCSI gateways that are defined. Disks that were created are left untouched within the Ceph storage cluster. When all is chosen, the Linux iSCSI target configuration is removed together with all RBD images that were defined within the iSCSI gateway environment, other unrelated RBD images will not be removed. Ensure the correct mode is chosen, this operation will delete data. A purge operation is destructive action against the iSCSI gateway environment. A purge operation will fail, if RBD images have snapshots or clones and are exported through the Ceph iSCSI gateway. The Ceph iSCSI gateway is the iSCSI target node and also a Ceph client node. The Ceph iSCSI gateway can be a standalone node or be colocated on a Ceph Object Store Disk (OSD) node. Completing the following steps will install, and configure the Ceph iSCSI gateway for basic operation. If previous versions of these packages exist, then they must be removed first before installing the newer versions. These newer versions must be installed from a Red Hat Ceph Storage repository. If the Ceph iSCSI gateway is not colocated on an OSD node, then copy the Ceph configuration files, located in /etc/ceph/, from a running Ceph node in the storage cluster to the iSCSI Gateway node. The Ceph configuration files must exist on the iSCSI gateway node under /etc/ceph/. Install and configure the Ceph command-line interface.For details, see the Installing the Ceph Command Line Interface chapter in the Red Hat Ceph Storage 3 Installation Guide for Red Hat Enterprise Linux. If needed, open TCP ports 3260 and 5000 on the firewall. Create a new or use an existing RADOS Block Device (RBD). See Section 2.1, “Prerequisites” for more details. If you already installed the Ceph iSCSI gateway using Ansible, then do not use this procedure. Ansible will install the ceph-iscsi-cli package, create, and then update the /etc/ceph/iscsi-gateway.cfg file based on settings in the group_vars/iscsigws.yml file when the ansible-playbook command is ran. See Requirements: for more information. Do the following steps on all iSCSI gateway nodes, as the root user, unless otherwise noted. You will be prompted to enter the environmental information. From the primary iSCSI gateway node, copy the iscsi-gateway.crt, iscsi-gateway.pem, iscsi-gateway-pub.key, and iscsi-gateway.key files to the /etc/ceph/ directory on the other iSCSI gateway nodes. See Tables 8.1 and 8.2 in the Requirements: for more details on these options. The iscsi-gateway.cfg file must be identical on all iSCSI gateway nodes. Copy the iscsi-gateway.cfg file to all iSCSI gateway nodes. You cannot use a mix of IPv4 and IPv6 addresses. There can not be any periods (.) in the pool name or in the image name. The max_data_area_mb option controls the amount of memory in megabytes that each image can use to pass SCSI command data between the iSCSI target and the Ceph cluster. If this value is too small, then it can result in excessive queue full retries which will affect performance. If the value is too large, then it can result in one disk using too much of the system’s memory, which can cause allocation failures for other subsystems. The default value is 8. This value can be changed using the gwcli reconfigure subcommand. The image must not be in use by an iSCSI initiator for this command to take effect. Do not adjust other options using the gwcli reconfigure subcommand unless specified in this document or Red Hat Support has instructed you to do so. Disabling CHAP is only supported on Red Hat Ceph Storage 3.1 or higher. Red Hat does not support mixing clients, some with CHAP enabled and some CHAP disabled. All clients must have either CHAP enabled or have CHAP disabled. The default behavior is to only authenticate an initiator by its initiator name. If initiators are failing to log into the target, then the CHAP authentication might be a misconfigured for some initiators. The next step is to configure an iSCSI initiator. See Section 8.3, “Configuring the iSCSI Initiator” for more information on configuring an iSCSI initiator. If the status is UNKNOWN, then check for network issues and any misconfigurations. If using a firewall, then check if the appropriate TCP port is open. Check if the iSCSI gateway is listed in the trusted_ip_list option. Verify that the rbd-target-api service is running on the iSCSI gateway node. When creating a disk, the disk will be assigned an iSCSI gateway as its Owner based on the initiator’s multipath layer. The initiator’s multipath layer will reported as being in ALUA Active-Optimized (AO) state. The other paths will be reported as being in the ALUA Active-non-Optimized (ANO) state. If the AO path fails one of the other iSCSI gateways will be used. The ordering for the failover gateway depends on the initiator’s multipath layer, where normally, the order is based on which path was discovered first. Currently, the balancing of LUNs is not dynamic. The owning iSCSI gateway is selected at disk creation time and is not changeable. 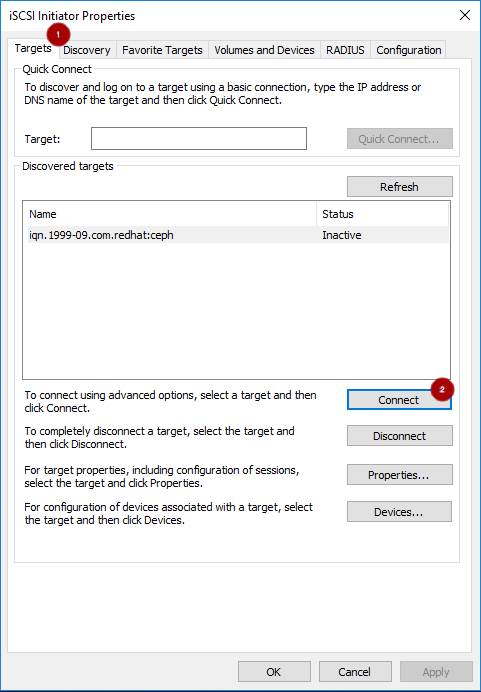 There are many settings that control how the iSCSI Target transfers data over the network. These settings can be used to optimize the performance of the iSCSI gateway. Only change these settings if instructed to by Red Hat Support or as specified in this document. The gwcli reconfigure subcommand controls the settings that are used to optimize the performance of the iSCSI gateway. Information about max_data_area_mb, including an example showing how to adjust it using gwcli reconfigure, is in the section Configuring the iSCSI Target using the Command Line Interface for the Block Device Guide, and Configuring the Ceph iSCSI gateway in a container for the Container Guide. The initiator name must match the initiator name used in the Ansible client_connections option or what was used during the initial setup using gwcli. Provide a CHAP username and password by updating the /etc/iscsi/iscsid.conf file accordingly. If you update these options, then you must rerun the iscsiadm discovery command. The Persistent Portal value is the IP address assigned to the iSCSI gateway listed in gwcli or the IP address of one of the iSCSI gateways listed in the gateway_ip_list, if Ansible was used. Click the Storage resource tab to list the existing storage domains. The New Domain window automatically displays known targets with unused LUNs when iSCSI is selected as the storage type. If the target that you are adding storage from is not listed then you can use target discovery to find it, otherwise proceed to the next step. LUNs external to the environment are also displayed. Select the target to use from the discovery results and click the Login button. Alternatively, click the Login All to log in to all of the discovered targets. 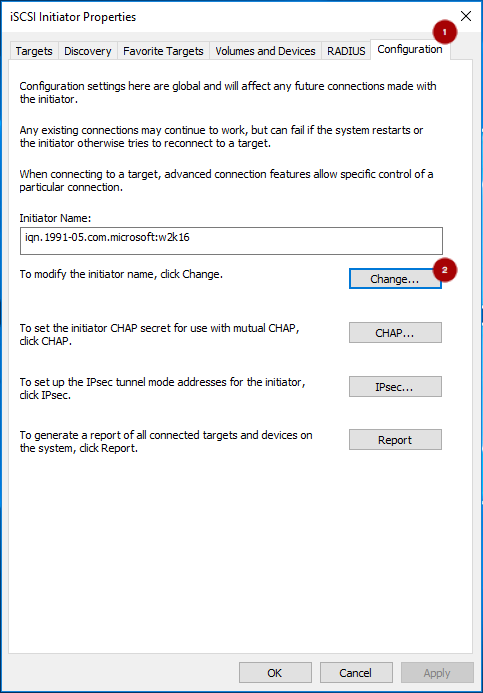 Install the iSCSI initiator driver and MPIO tools. 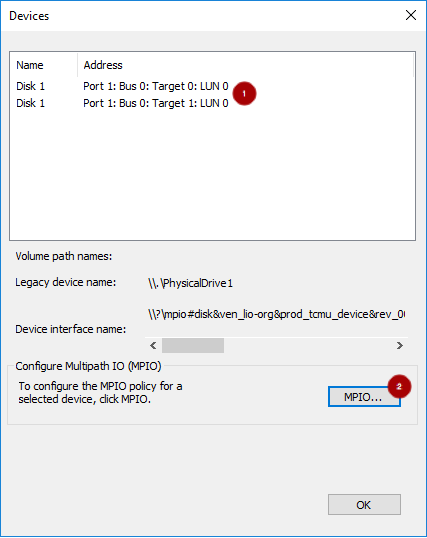 Launch the MPIO program, click on the Discover Multi-Paths tab, check the Add support for iSCSI devices box, and click Add. This change will require a reboot. Windows Server 2016 does not accept a CHAP secret less than 12 bytes. 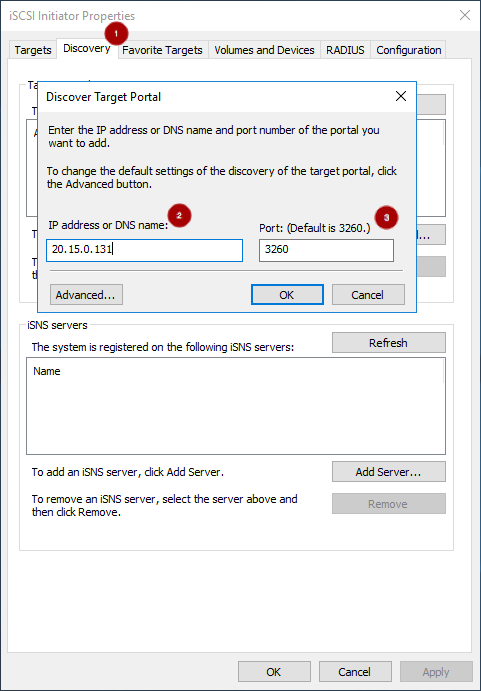 Repeat steps 5 and 6 for each target portal defined when setting up the iSCSI gateway. If the initiator name is different than the initiator name used during the initial setup, then rename the initiator name. From iSCSI Initiator Properties window, on the Configuration tab , click the Change button to rename the initiator name. 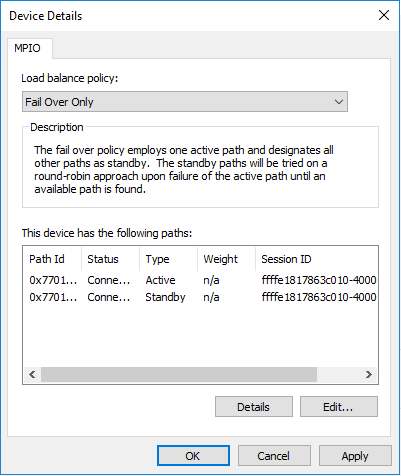 Configuring the MPIO load balancing policy, setting the timeout and retry options are using PowerShell with the mpclaim command. The iSCSI Initiator tool configures the remaining options. Red Hat recommends increasing the PDORemovePeriod option to 120 seconds from PowerShell. This value might need to be adjusted based on the application. When all paths are down, and 120 seconds expires, the operating system will start failing IO requests. + Replace $MPIO_DISK_ID with the appropriate disk identifier. There will be one Active/Optimized path which is the path to the iSCSI gateway node that owns the LUN, and there will be an Active/Unoptimized path for each other iSCSI gateway node. Verify the initiator name in the Name & alias section . If the initiator name is different than the initiator name used when creating the client during the initial setup using gwcli or if the initiator name used in the Ansible client_connections: client variable is different, then follow this procedure to change the initiator name. 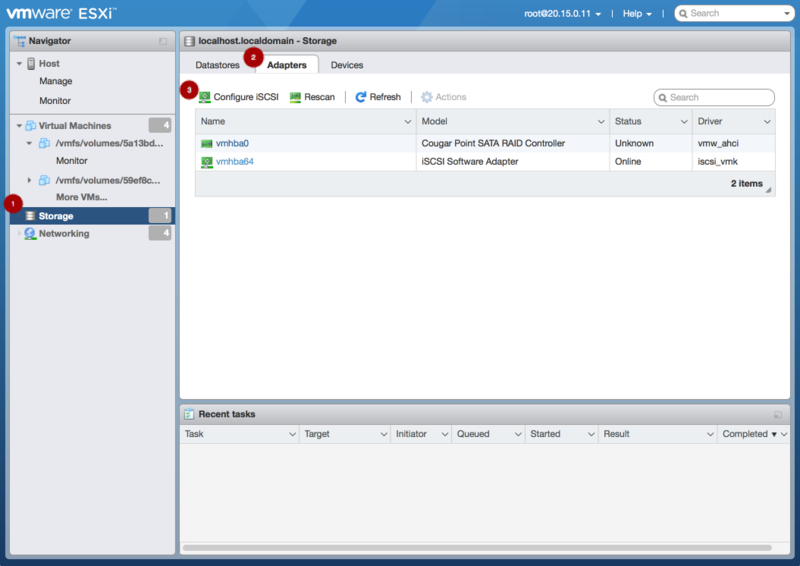 From the VMware ESX host, run these esxcli commands. Configure CHAP. Expand the CHAP authentication section . 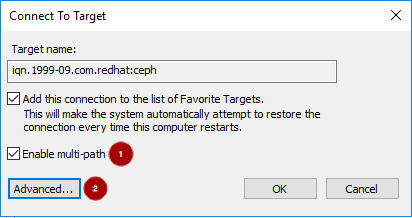 Select “Do not use CHAP unless required by target” . Enter the CHAP Name and Secret credentials that were used in the initial setup, whether using the gwcli auth command or the Ansible client_connections: credentials variable. 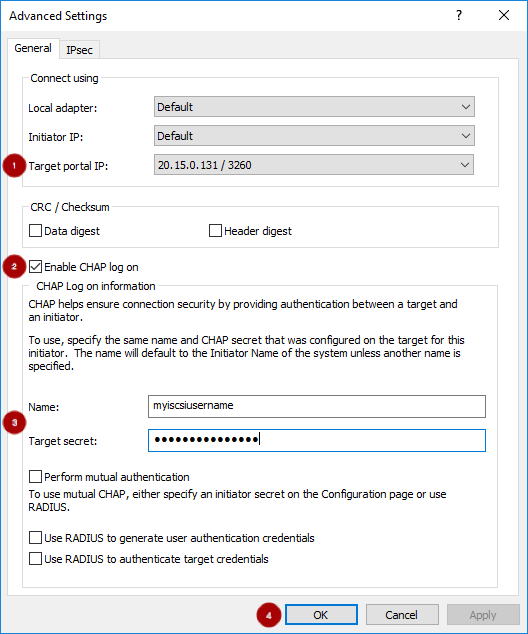 Verify the Mutual CHAP authentication section has “Do not use CHAP” selected. > kernel: Security negotiation failed. > kernel: iSCSI Login negotiation failed. Configure the iSCSI settings. Expand Advanced settings . Set the RecoveryTimeout value to 25 . Set the discovery address. In the Dynamic targets section , click Add dynamic target . Under Address add an IP addresses for one of the Ceph iSCSI gateways. Only one IP address needs to be added. Finally, click the Save configuration button . From the main interface, on the Devices tab, you will see the RBD image. Replace $DEVICE_ID with the appropriate device identifier. Verify that multipathing has been setup correctly. The Group State value of active indicates this is the Active-Optimized path to the iSCSI gateway. The gwcli command lists the active as the iSCSI gateway owner. The rest of the paths will have the Group State value of unoptimized and will be the failover path, if the active path goes into a dead state. Match the path name with the ISID value, and the RemoteAddress value is the IP address of the owning iSCSI gateway. Upgrading the Red Hat Ceph Storage iSCSI gateways can be done by using an Ansible playbook designed for rolling upgrades. A running Ceph iSCSI gateway. Verify the correct iSCSI gateway nodes are listed in the Ansible inventory file (/etc/ansible/hosts). Upgrading the Red Hat Ceph Storage iSCSI gateways can be done in a rolling fashion, by upgrading one iSCSI gateway node at a time. Do not upgrade the iSCSI gateway while upgrading and restarting Ceph OSDs. Wait until the OSD upgrades are finished and the storage cluster is in an active+clean state. Having root access to the iSCSI gateway node. If the rbd-target-gw service successfully stops, then skip to step 4. If the backstores and Storage Objects are empty, then the iSCSI target has been shutdown cleanly and you can skip to step 4. If multiple services are using the iSCSI target, then run targetcli in interactive mode to delete those specific objects. Red Hat provides an additional tool for Ceph iSCSI gateway environments to monitor performance of exported RADOS Block Device (RBD) images. The gwtop tool is a top-like tool that displays aggregated performance metrics of RBD images that are exported to clients over iSCSI. The metrics are sourced from a Performance Metrics Domain Agent (PMDA). Information from the Linux-IO target (LIO) PMDA is used to list each exported RBD image with the connected client and its associated I/O metrics. Do the following steps on the iSCSI gateway nodes, as the root user. For more details on performance co-pilot, see the Red Hat Enterprise Linux Performance Tuning Guide. By default, gwtop assumes the iSCSI gateway configuration object is stored in a RADOS object called gateway.conf in the rbd pool. This configuration defines the iSCSI gateways to contact for gathering the performance statistics. This can be overridden by using either the -g or -c flags. See gwtop --help for more details. The LIO configuration determines which type of performance statistics to extract from performance co-pilot. When gwtop starts it looks at the LIO configuration, and if it find user-space disks, then gwtop selects the LIO collector automatically. In the Client column, (CON) means the iSCSI initiator (client) is currently logged into the iSCSI gateway. If -multi- is displayed, then multiple clients are mapped to the single RBD image. Red Hat does not support mapping a single RBD image to multiple iSCSI initiators (clients). # file as a good configuration file when no variable in it. # client sees the gateway group as a single storage subsystem. # gateways can be added, but the order must *not* be changed. # rbd_devices defines the images that should be created and exported from the iscsi gateways. # than the current size of the rbd is ignored. # These options can be passed using the 'ceph_mds_docker_extra_env' variable.